It really depends on what your long hair goals are, with duration, damage, & investment being the biggest concerns. Your hair is a product of both the way you treat it as well as genetics & may never reach down your back in thick waves. You may never be able to rock that long fishtail braid look, regardless of volume-building products. When you want that full crowning mane of fancy hair, but are stuck at a lob, you have mermaid style options. Many female celebrities wear hair extensions; they claim they cut their hair, but don’t be fooled, many times, they took their extensions out! The fun of an instant change & the versatility are some of the most exciting things about adding hair to your own. 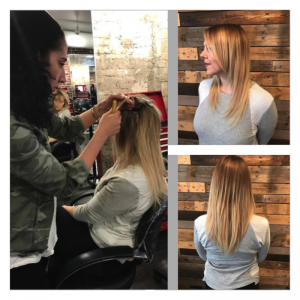 Francesca lays out your options, “Extensions, like everything else, have really evolved throughout the years. We have multiple options to choose whatever system works best for them! There are so many extension programs available at Crimson that don’t compromise the hair’s integrity: they all look very natural & are comfortable to wear!” Pictured here, Francesca wears a Halo Couture hair piece. Consultations are always free, so feel free to start the discussion on what your hair goals ultimately are. The entire staff at Crimson is HotHeads certified, so you don’t even have to go to a different chair to pump up the volume with length & thickness! 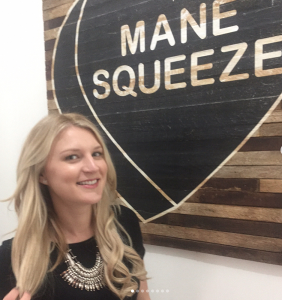 Crimson Master Stylist Danielle is a Hot Heads enthusiast: “Hot Heads Tape In Extensions lay flat to the head to work naturally with the head shape, which creates a seemless look from root to end. 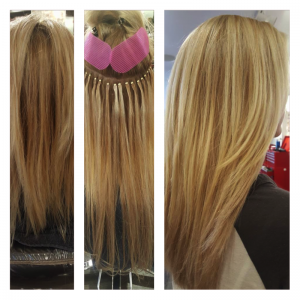 Hot Heads extensions are easy for clients to maintain & easy to remove! The quality & flexibility of the lightweight hair makes for a premium look & style experience.” Danielle is currently offering an Extensions Promotion! The Halo Couture hair piece features a ‘Miracle Wire’ halo which drapes around your crown; beautifully transform your look with no damage, no commitment, & all the volume! Sherry is always rocking her halo, even in her perfect ponytail! Full head extensions are available as well as funky accent pieces, including fashion colors: lavendar, hot pink, baby blue! We carry the whole line of Babe Extensions: Flat Tip Beaded, Fusion Keratin Bond, & Tape-In! Babe Flat Tip Beaded Extensions, whose application requires no chemicals, glue, or heat. They lay flat like tape ins, but use adhesive-free microbeads to clamp each extension strand. Hair lasts 3 – 6 months & can be reused up to 3 times. Franc loves the Babe brand: this is a before, during, & after photo of one of his clients. Babe Fusion Keratin Bond Extensions involves connecting extensions to hair with keratin bonds. Your hair is made of keratin protein, which allows for greater fusion. Each extension strand comes pre-tipped with keratin bond, with each strand individually attached for ultimate styling potential. Application takes 2 – 3 hours, but may be reused up to 3 times for 2 – 4 months each time. 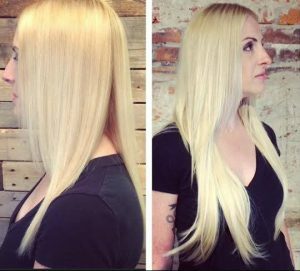 Babe Tape-In Extensions are quick & easy & always a perfect choice for a style change. Application takes less than an hour & hair lasts 3 – 6 months with proper care! Bring images of the hair style you’ve always admired and your stylist will help you determine the Extensions choice that is right for your hair needs & lifestyle.